UPDATED Two highly responsible children ages 7 and 10 looking for some early morning care. Want to be hired by Sean? 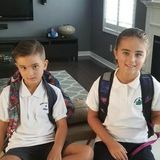 My wife and I both start work early in the morning and require someone to be at our house by 7am to feed and get our two highly responsible children ready for school. As my work involves rotating shifts, this would only be required 2 out of 3 weeks. No Pickup required after school. Looking for some part-time help now, with potential for full-time au pair.